From here comes our name, Rocche (Fortifications) just because Monticello is a perched village, with the ancient name Montezelo to whom we wanted to give a touch of modernity and here is Montexelo. Our four apartments in historic center recall the sea, present here millions of years ago. You can enjoy the breakfast that you will find upon your arrival: there'll not to be cappuccino but excellent local products made by the best producers. You will have the opportunity to appreciate them better after a restful night but above all in full autonomy and when you wish. We have chosen to respect nature. Discover our "green amenities" on Eco-Friendly! Our Spa will give you an intimate multi-sensory experience, only yours! What about the Castle that whatches you prodly while you have a good relax on the terrace? It wait to be reached by taking a walk, where guided tours are waiting for you. And than going down, here is the wall created by the artist Valerio Berruti, with an hundred painted concrete panels fresco and partly glazed with white, a pluzzle that creates figures of children, all different and all the same. And they, children are welcome! 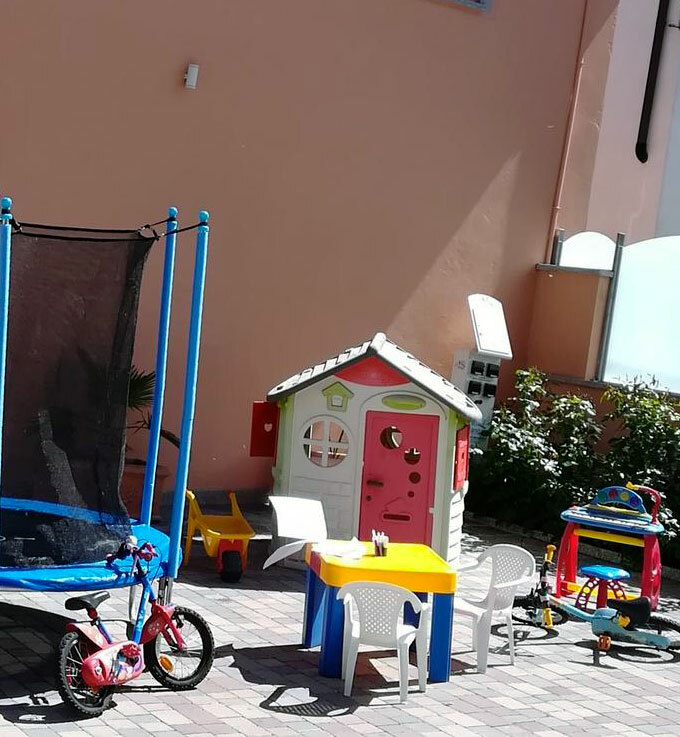 They will be able to play in an outdoor play area in safety: the courtyard is in fact closed by an automatic gate. Take a seat, you're welcome! to reflect the peculiarities of the Region. our spaces are safe for they. Playground for to amazing even the youngest children!